Iguazu falls tour, An impressive event! 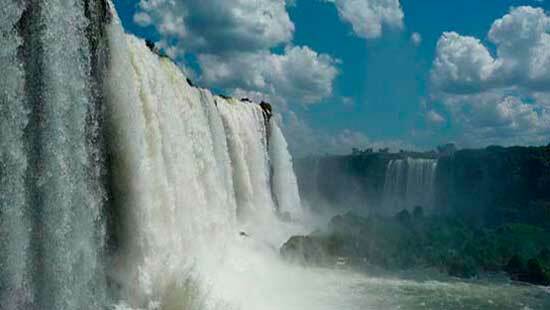 You will begin your tour to Iguazú taking off from Buenos Aires airport. Once you land in Iguazu airport a tour guide from 01argentina will be waiting for you with a sign with your last name to transfer you to your Hotel in Puerto Iguazu city. In addition he will give you the information for all the exact pickup times for tours and transfers during your stay in Iguazu. You will check in your hotel and will have free time in the afternoon for visiting and exploring the town of Puerto Iguazu on your own, for personal activities or just for relaxing with hotel facilities like swimming pool. After breakfast, we will pick you up at the lobby of your hotel and you will leave for a full day excursion to the Argentine side of Iguazu Falls. Upon arriving at the National Park Iguazu, you will take part of the excursion by the Jungle Train, a circuit of ecologic trains that goes through ecological wonders of the park and borders the river, allowing visitors to walk through the park and access different footbridges. You will be guided around several paths inside the National Park to witness the incredible view of more than 200 waterfalls, visiting the Green Way, the Upper and Lower trails where you will enjoy a panoramic view of the falls as well as the delta of the Iguazú River, with its islands and lush vegetation and the Devil´s throat path that is the farthest situated but the most impressive fall. Even though the order in which you visit the trials may vary. 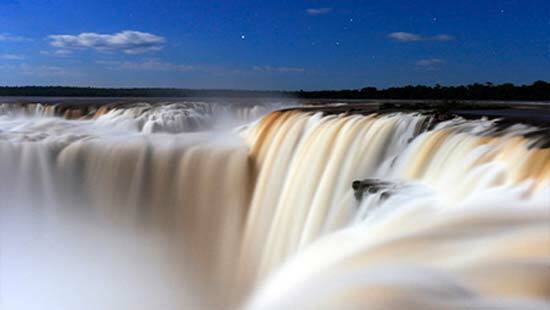 At the end of the tour we will drop you off in the lobby of your Hotel in Puerto Iguazú. After the Breakfast our tour guide will pick you up in your hotel in order to take you to the Brazilian side of Iguazu falls. 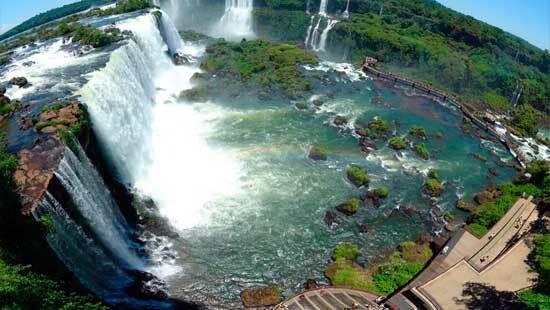 The Brazilian Iguazu falls National Park was declared a World Natural Heritage for being a natural reserve of paramount importance in South America. The main attraction is the contact with the great deal of fauna that can be seen through the light that enters the green roof of the rainforest as well as the world famous Iguazu waterfalls that form a circle of 2700m of width around the four falls. Torrents of water, whose roar can be heard for miles, plunge some 250 feet down. The panoramic view is unbeatable since the walkway circuit is directly in front of the waterfalls. This half day tour in the Brazilian side is shorter than the one on the Argentinian side, because it consists of only one path, which allows a panoramic view of the Argentine Falls and the four falls that belong to Brazil (Benjamin Constant, Deodoro, Floriano and Santa María). Once the tour is finished we will transfer you to your hotel and at scheduled time, transfer from hotel to airport and flight back to Buenos Aires. End of the Iguazu falls tour. Round trip flights Buenos Aires - Puerto Iguazu - Buenos Aires. Transfer from airport to Hotel in Puerto Iguazu. Transfer from Hotel to airport in Puerto Iguazu. Tour to the Argentinian side of the waterfalls. 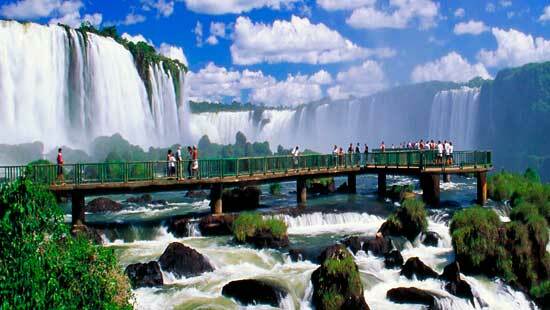 Tour to the Brazilian side of the waterfalls. 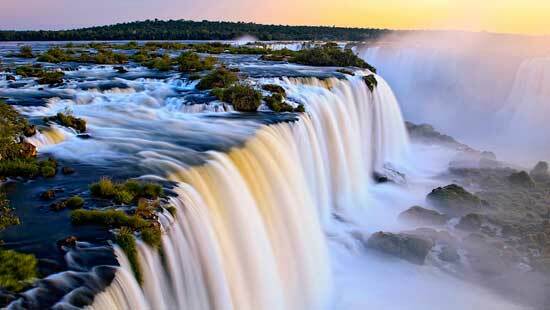 2 hotel nights in Puerto Iguazú with breakfast included. Group Service sharing the tour guide and bus with other tourists. Our Travel Agency is happy in organizing your vacation package to this amazing tourist destination of Argentina and Brazil Latin America. Request a quote for free from our contact form and our expert travel agents will reply you soon! We offer the complete travel package including the domestic round trip plane tickets from Buenos Aires, the airport transfers in Iguazu and 2 nights in selected hotel from basic to luxury ones. In addition during our tour entitled “An impressive event” described in this page we will include you a half day excursion to visit The Iguazu National Park in Brazil which was declared by UNESCO in 1986 Natural Heritage, and it practically coincided with the same statement of the Argentine side, in this case under the nomination of Iguazu National Park. In the Park in Brazil the visitors area is constituted by a single circuit of gateways located in front of the waterfalls. That's why it is said the scenic view offered in this Park is really impressive. This travel packge also includes, of course, a full day excursion from 8 Am to 5 Pm to the National Park in the Argentine side where the Falls can be admired from the foot of the falls, in the Lower Circuit, or from "above" in the Upper Circuit. From the Visitor Center you can have access to all this circuit through ecological train or green trail. The lower circuit has a length of 1600 meters, it has stairs and from this circuit you can have can access to the Great Adventure Boat ride that combines the essence of Iguazu National Park: the jungle and the falls in a single run. The upper circuit has a length of 1200 meters and it also has beautiful views, however the most important waterfalls is the Devil's Throat. You can have access to this view point by the ecological train stopping in the Garganta station that provides access to the gateway. This is a fantastic trail, and the view from the balcony is stunning. 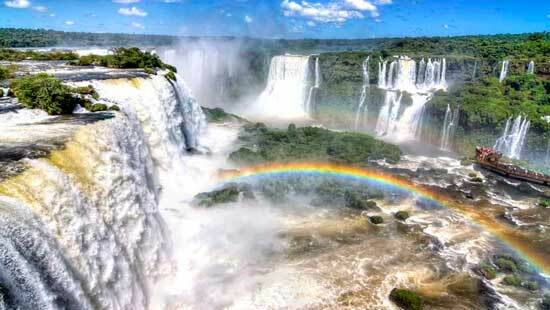 You also can take more tours of Iguazu Falls combining other tourist destinations in Argentina like The Pertio Moreno Glacier in El Calafate Patagonia Argentina, the capital city of Buenos Aires or Salta and Jujuy in the Northwest. Summing up you can count on with our travel agency to book trips, plane tickets, tour packages, accommodation and get the most useful tips to travel to Iguazu Falls always recommened by expert local travel agents. Besides, our website offers a lot of travel information with maps of the National Parks of Iguazu and a lot of Travel information of Argentina in general. We really hope to hear from you soon and do not hesitate in asking us more information please.